Louisiana-Pacific is well positioned for the future with the start-up of its new $140 million Laminated Strand Lumber operation in Maine that uses wood sourced from Quebec, Nova Scotia and New Brunswick, as well as local wood. 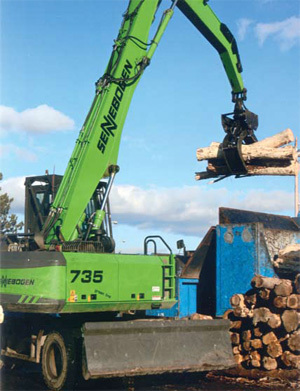 Out in the L-P millyard, a Sennebogen 735 sorts wood for the Laminated Strand Lumber operation's specific mix: 75 per cent aspen or poplar, and 25 per cent eastern hardwoods, in particular birch and maple. As we approach the end of the first decade of the 21st Century, news from across North America about investment in new wood processing plants is pretty scarce. Too often the news has been about cutbacks, lay-offs and mills closing permanently. So it's really encouraging news when a company invests millions of dollars in a new plant that incorporates cutting-edge technologies to produce an emerging wood product that promises to create innovative design capabilities and provide economic advantages in the home construction industry. 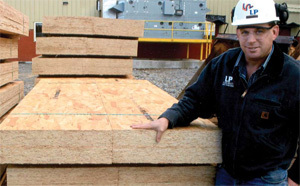 Louisiana-Pacific decided several years ago to invest more than $140 million into its New Limerick mill near Houlton, Maine, to allow it to expand into the production of Laminated Strand Lumber (LSL). The company carried through with the project despite the economic downturn. Louisiana-Pacific is betting that when the industry recovers, the mill will be able to produce around eight million cubic feet of L-P SolidStart LSL product and supply it through its distribution system across North America. LP promotes SolidStart LSL for a wide variety of residential construction applications including headers and beams, wall studs, roof beams and rafters, columns, rim boards and stair stringers--pretty much anywhere traditional lumber is used. The product's big selling point is that because of its enhanced strength and consistency, fewer pieces of SolidStart LSL are required compared to conventional lumber. The enhanced strength lets LSL span greater distances, and carry more load. SolidStart LSL design properties also present a whole new set of opportunities for innovative engineered designs and balloon framing. L-P also promotes SolidStart LSL's conservation qualities, pointing out that trees that are generally not fit for sawn lumber can now be used to manufacture a high quality construction product. In addition, the high consistency of the product means no culling at the job site. An added value for builders is labour savings, since time will not be directed to laminating sawn lumber to build carrying beams and headers. New Limerick is the first Louisiana-Pacific mill to produce strand lumber, and one of only a handful of mills in North America that produce LSL. Marc Pinette explained that as the operation's procurement forester, he is usually on the road meeting contractors and securing deliveries of aspen and other hardwoods to the Louisiana-Pacific OSB mill at New Limerick. However, with the new mill start-up and production testing, he has been spending a lot more time at the mill. "Like every mill start-up there have been a few minor glitches to smooth out, but basically the mill is performing up to our expectations," says Louisiana-Pacific's Marc Pinette. "We started construction in late-2006, and we made our first LSL board in March 2008. Like every mill start-up, there have been a few minor glitches to smooth out, but basically the mill is performing up to our expectations," said Pinette. LSL is a structural engineered wood product based on wood strand technology and was developed in the 1980s. The process utilizes debarked low-grade trees such as aspen, which are flaked into strands. The flakes are dried, coated with resin and then oriented parallel in a thick mat. With the aid of injected steam, mats are pressed into large billets. The billets can then be sawn into conventional lumber dimensions. 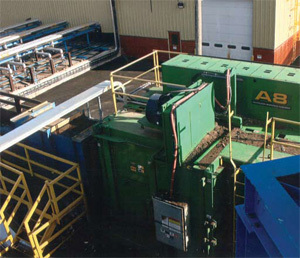 Pinette explained that development of the LSL operation actually began in 2004, when L-P shipped several containers of aspen and hardwoods to Dieffenbacher labs in Germany. Dieffenbacher is an international company that designs and manufactures complete production systems for the wood panel industry. Dieffenbacher created a lab model LSL plant and tested different combinations of species, as well as formulating the specific recipe for an adhesive and other technical details for L-P's operation. The recipe for wood fibre in the L-P operation is a specific mix, 75 per cent aspen or poplar, and 25 per cent eastern hardwoods, in particular birch and maple. Pinette explained that the fibre properties provide a strong--and relatively light--finished product. "A higher proportion of dense hardwoods would result in a very heavy product that would be difficult to manhandle in conventional construction," he explained. "Our LSL product also has excellent nail penetration and holding properties. If the product had a higher ratio of dense hardwoods, there would quite possibly be issues around nails being able to penetrate the product." The New Limerick mill's wood basket extends 200 miles, which brings wood from Nova Scotia, New Brunswick, southern Quebec, as well as Maine. Wood is delivered as 108-inch logs and as tree length. Part of the mill upgrades included installing an automated Scale Boss weighing system. The wood yard is essentially a 24-hour, five-days a week operation. The new mill has an annual consumption of 180,000 to 200,000 cords of wood. Tree length wood is slashed into 108-inch logs. Along with cut-to-length logs, they are fed directly to an A-8 Nicholson debarker. The operation maintains a supply of peeled logs in the yard as a cushion for smoothing out production spikes. Peeled logs are soaked in a water bath with 200 cords capacity, primarily as a defrost process for winter. Energy to heat the water is supplied from a steam plant that burns mill waste. consumption of 180,000 to 200,000 cords of wood. Logs are flaked with a CAE long log flaker. The nine inch flakes are stored in wet bins, while fines and sub-grade material are transferred to the wood burning energy plant. Wet flakes move on to a TSI rotating drum dryer with heat supplied from flue gas from the energy plant. The TSI dryer takes flakes to two per cent moisture and the flakes then move into dry bins. In the next step in the process, the dry flakes are covered with an isocyanate adhesive, similar to the adhesive used as the interior adhesive of OSB. Spinning head atomizers completely coat the flakes with adhesive. The LP mill can use either dry resin or liquid adhesive. The resin covered flakes are transferred to four hoppers situated over the lumber forming line. The forming line, manufactured by Dieffenbacher, is a slowly moving eight-foot wide conveyor belt. The resin coated flakes are oriented parallel and laid down to a depth of between seven and 18 inches, depending on the dimension desired for the final strand lumber product. Once the mat is formed, it is trimmed to 64 feet and fed into the Dieffenbacher press. The single mat is compressed to 350 psi, while steam is injected through the press faces to activate the resin and glue the mat into a solid mass. Once the mat has been under pressure for the prescribed period, it emerges from the press. The LSL sheet is referred to as a billet as it enters the sawmill. Sawmill equipment was sourced from Globe Machine Manufacturing Co. The first breakdown cut splits the 64-foot by eight-foot billet into two four-foot wide sheets. The four-foot billets are fed into a rotating dryer where the billet cools and cures. The four-foot wide billets are then lifted by overhead cranes and piled in the warehouse and eventually ripped and trimmed to specs in the sawmill. A Globe 18-inch gang saw rips the four-foot wide billets into dimension lumber, such as 2x4, 2x6, 2x8 and 2x10. In addition to shipping dimension sizes, LP also ships up to 64-foot lengths by rail. Usually, edges of the SolidStart LSL product are paint-coated. However some may not be, by customer request. Once the lumber has been trimmed to length, it is wrapped and moves to the outdoor storage yard. LP subjects its SolidStart LSL product to a series of quality control tests, starting with basic measuring tape data to ensure consistency and to check for visual defects, and concluding with destructive testing to ensure the product complies with American Panelboard Association specifications. Tree length wood is slashed into 108-inch logs. Along with cut-to-length logs, they are fed directly to an A-8 Nicholson debarker (above). Louisiana-Pacific has operated an OSB mill at New Limerick since 1982. The mill's focus on safety and the environment has earned it designation as an Occupational Safety and Health Administration (OSHA) Voluntary Protection Program site and membership in the Environmental Protection Agency's (EPA) Performance Track program. In 2006, the mill was awarded the Maine Governor's Award for Business Excellence. "Our highly motivated and productive workforce was one of the key elements that led Louisiana-Pacific to invest in LSL at the New Limerick operation," said mill manager Skip Cleary. The expanded operation employs 160 people. "Our people are well trained, and have an excellent work safety record. As a result, we have a very high employee retention level. We look forward to a bright future and bringing added prosperity to the region with LSL." With the drop in demand for lumber in the United States, efforts to develop a larger market in China for Canadian lumber have been ramped up, and a B.C. First Nations band recently set up a representative office in China to tap into this potentially huge market. Martin Marsolais and Sons Ltd has a long history of being open to change on the logging equipment side, and it's a tradition that the company continues to this day, with the third generation of the Marsolais clan now out in the woods. 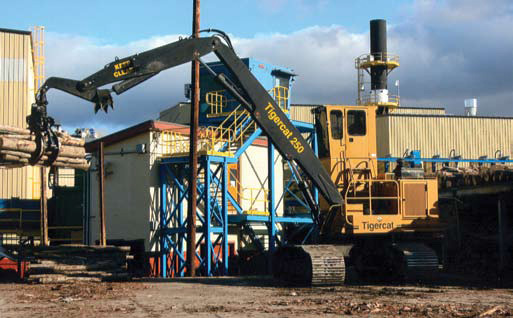 million biomass power plant at the AbitibiBowater pulp and paper mill in Fort Frances, Ontario, forest slash that had been previously burned in the bush is now being ground up by local contractors and transported to the power plant. Pinnacle Pellet Inc. is charting its own path, with a very successful business strategy that includes a new $20 million wood pellet plant in B.C. Louisiana-Pacific is positioned well for the future with the start-up of its new $140 million Laminated Strand Lumber operation. The Northern Alberta Forestry Show is working to add value by including the construction sector in the show, being held May 8 in Grande Prairie. Jim Stirling notes that as if the forest industry doesn't have enough concerns, a familiar problem--the lack of progress in negotiations with First Nations groups--is seething just below the surface, threatening to explode.